The critics agree: the standout performance of Wonder Woman belonged not to Gal Gadot in her starring role as the perfectly coiffed face of fourth-wave feminism, but to the mythic Greek island of Themyscira. A verdant idyll capable of stealing scenes even from Robin Wright’s own heavenly facial topography, Themyscira’s vertiginous waterfalls and luscious rainforests will surely be credited with a spike in inbound flights headed toward Greece over the months and years to come. If not, then you can likely level the blame at Aesop, whose new range of aromatic room sprays, released this week, are both the olfactory embodiment of the archipelago and the salve for your Instagram-induced summer holiday FOMO. Your average scent diffuser these are not, naturally. The cerebral scents have each been named for a paragon of Greek antiquity. Istros, for example, has been named for an ancient Greek port town, and is a slow-burning blend of pink pepper, lavender and tobacco with lingering cedar and sandalwood notes. To say that it has had a transportive effect on my desk and those of my neighbouring colleagues would do it a great disservice. GRAZIA’s resident Greek, Beauty Editor Chrisanthi Kaliviotis, was so moved by a single spritz that she likened the scent to being in a Greek Orthodox church. Amen. I’m a convert. Another scent, Cythera, invokes its namesake island through a blend of neroli, geranium and patchouli; a third, Olous, honours the subaqueous city long along lost to the tides with a paean of grapefruit, bergamot and jasmine matched with galbanum, cardamom, cedar and incense. 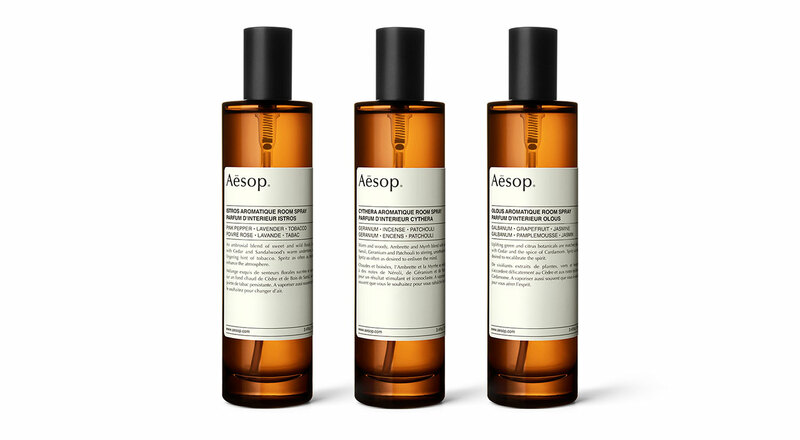 On occasion of Aesop’s maiden voyage into the treacherous waters of aromatic room sprays, they’ve collaborated with the American composer and musician Jesse Paris Smith, who has composed three original tracks inspired by each fragrance. Available for download, each has been designed to enhance the olfactory experience.